There are several common ear and stalk diseases that affect corn every year, and regardless of field, there’s always a risk for disease. As we look forward to harvest, now is the time to identify and plan for proper storage of potentially moldy grain. This is the first of a two-part series that investigates the most common examples of ear and stalk diseases and discusses ways to avoid them. Ear rots can affect grain quality and reduce nutrient values, test weight and yields. In some instances, mycotoxins may be produced, which can negatively affect how well livestock can digest the grain. 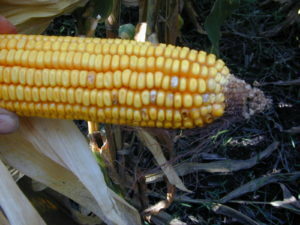 Many corn hybrids vary in their susceptibility to certain ear rot. Environments such as corn-on-corn and reduced tillage increase the chance and severity of ear diseases showing up this time of year. 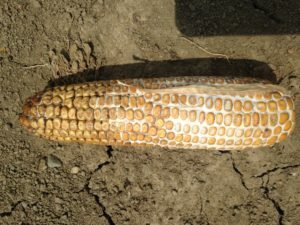 Other conditions like low fertility, extremely high populations, damage from wind, hail, or tillage, and a tight husk can lead to higher incidence of ear rot. 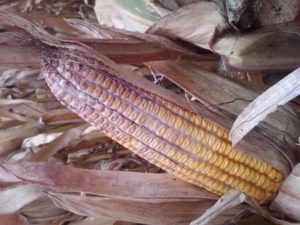 Also, fall rains during harvest time that limit corn drying favor corn ear mold development. To reduce the chance of disease in your corn, avoid planting in corn-on-corn conditions and reduce insect wounds. 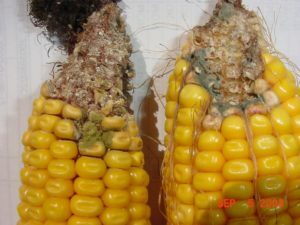 Also, if your feeding corn to livestock an early harvest and drying the corn may needed to reduce the amount of ear mold development. Insect wounds can be reduced by planting SmartStax® or VT Double PRO® corn products designed to limit feeding insects. It’s also beneficial to choose B&A Genetics hybrids combined with Protect ‘N Grow Seed Treatment with multiple fungicides to protect against many diseases in the early development of corn. As always, we encourage you to reach out and our team will help you determine the best course of action for your fields.